Ivory color Wedding Dress! Worn once in July, 2018. Bought brand new for $1,150. This is the perfect dress for those who are looking for something simple, yet elegant. Such a simple dress, but flows so beautifully (especially if there is a breeze). It has been professionally cleaned. 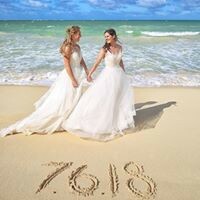 The dress was worn for a beach wedding, but shows no sign of usage. This dress is perfect for an outdoor wedding. The dress has sewn in bra cups (size b), but can easily be removed. I am 5ft, 10in and the dress now slightly covers my toes (had one inch removed). I had size b cups sewn into the top for convenience.